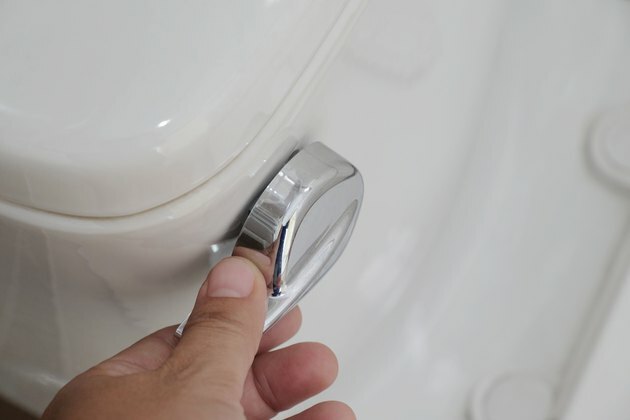 If you have a space that would benefit from a toilet but don't have a budget to put in a whole new plumbing system, a macerating toilet is a good option. Clean and easy to use, a macerating toilet may be more expensive to purchase, but it is easy to install, maintain and use without issue if you are far from the main drain line. A regular toilet has a drain line that is below the level of the waste so it uses gravity to pull the waste down and out. A macerating toilet is an upflush toilet system. It sends waste to a unit behind the toilet in a large container or in a container in the wall. High-powered blades liquefy the waste before it is pumped out of the unit through a pipe that is directly tied to the main drain line. They are more expensive than standard toilets, but much less expensive than having to create and build an entirely new plumbing system in order to have a toilet in your home. They aren't recommended as a main toilet for a large family or home. The pump can get overworked and fail if it is used all day every day by a large number of people. If you are far from the main drain line for your plumbing, a macerating toilet can save your behind. It isn't overly expensive and can be installed without having to complete a major plumbing overhaul to have another toilet in your living space. Macerating toilets work well in cabins or homesteads off the grid, basement conversions, workshops that are located far from the home on a large property or other unique situations where a toilet would be a beneficial addition to a space. The power of the macerator toilet pump is determined by the range of pipe needed to reach the main drain line. The toilet needs to be within 10 to 15 feet of vertical lift and 100 to 150 feet of horizontal run. Make sure the toilet pump can handle the range. You'll need access to a few things before installing a macerating toilet. If you are highly experienced in plumbing projects and can easily lift the toilet, which can weigh from 30 to 80 pounds, then you should be able to complete the installation. If not, a plumber should be hired to install the macerating toilet. The Better Business Bureau will have information on plumbers who are in good standing in your area. The macerating blades and pump are typically contained in an oil-filled enclosure, so installation and maintenance shouldn't be difficult if the toilet is put in correctly. Putting in a macerating toilet is almost easier than installing a standard toilet. Discharge pipe – Connect this first. Make sure that the discharging pipe sizing is correct. Any turns should be completed using two 45-degree elbows rather than 90-degree turns. It needs to be properly vented. Water system – Connect the toilet tank to your water supply to remove waste. Power supply – Plug the pump into the electric supply. Use a GFI outlet and 15-amp electrical cord. Vent the pump – Vent the macerator pump into your home's vent system so that air can move in and out of the pump area. You don't necessarily need to use the home's venting system. If you make a venting system, make sure it is up to code. Finally, make sure all pipes are protected from freezing and are supported and well connected.